This article discusses the theoretical and practical aspects of using bedside ultrasonography for pneumothorax. Although the Focused Assessment with Sonography in Trauma (FAST) examination has been part of Advanced Trauma Life Support (ATLS) for over a decade,  the addition of pneumothorax evaluation to this protocol to create the extended FAST (e-FAST) examination is a relatively new development. It is critical to maintain a high suspicion for a pneumothorax in all trauma patients with a significant mechanism, as well as in nontrauma patients with a history or physical findings suggestive of the diagnosis. There are no specific contraindications for bedside ultrasonography in the ED; clinical judgment should be used to determine its appropriate application. Patients with significant pulmonary disease and previous pneumothoraces may have altered findings on ultrasound examinations. In these special circumstances, patients should undergo definitive imaging with thoracic CT scanning when stable. Successful application of ultrasonography to the detection of pneumothorax requires a solid understanding of the basic anatomy and pathophysiology of the pulmonary system. Both lungs are divided into lobes. The gross functional subunits of each lung are called segments. The right lung comprises 10 segments: 3 in the right upper lobe (apical, anterior and medial), 2 in the right middle lobe (medial and lateral), and 5 in the right lower lobe (superior, medial, anterior, lateral, and posterior). The left lung comprises 8 segments: 4 in the left upper lobe (apicoposterior, anterior, superior lingula, and inferior lingula) and 4 in the left lower lobe (superior, anteromedial, lateral, and posterior). For more information about the relevant anatomy, see Lung Anatomy. Normally, the lungs are covered by a continuous serous membrane that folds back on itself to create 2 layers: the visceral pleura, which covers the lungs and adjoining structures, and the parietal pleura, which is attached to the chest wall. The pleural cavity is the "potential" space between these closely apposed layers and is normally filled with a small amount of pleural fluid, which allows for normal lung sliding during respiration. In normal circumstances, negative pressure prevents air from entering the pleural space. A pneumothorax occurs when air infiltrates the pleural cavity, either as a result of traumatic injury to the chest wall or spontaneously (spontaneous pneumothorax is historically believed to be caused by the rupture of pleural blebs). Although there are many risk factors that predispose patients to the development of a pneumothorax, most patients presenting to the ED have pneumothorax secondary to trauma. A particularly dangerous complication, the dreaded tension pneumothorax, can develop when an injury to the lung parenchyma or bronchus acts as a 1-way valve, allowing air to enter the pleural cavity but preventing it from escaping. A tension pneumothorax can develop rapidly and is greatly exacerbated by positive-pressure ventilation, posing a great danger to intubated patients. For all of these reasons, rapid detection of pneumothoraces in trauma patients is critical, and bedside ultrasonography is a fast, reliable means of accomplishing this task. A portable ultrasound machine with a high-frequency (5-10 MHz) linear probe is typically used. A curvilinear, low-frequency probe (2-5 MHz) is employed by some sonographers; although it is more difficult to use accurately, it allows the entire E-FAST examination to be performed without any switching of probes. Most studies evaluating the sensitivity of bedside ultrasonography in detecting pneumothoraces have used high-frequency linear probes, which are the standard recommendation for novice practitioners. Sedation is typically not required for bedside ultrasonography. The patient should be placed in a supine position (see the image below). If it is clinically necessary, the patient may also be examined while sitting upright, but this positioning may reduce the sensitivity of ultrasonography for detecting small pneumothoraces. For optimal pneumothorax evaluation, patient is examined in supine position. The ribs are identified; these will appear hyperechoic, and their acoustic shadows will appear as hypoechoic rays extending from the ribs. The interspace between the 2 ribs is used as a fixed anatomic landmark during the examination. Next, the pleural line is identified; this is a hyperechoic line found at the inferior border of the space between the 2 ribs. 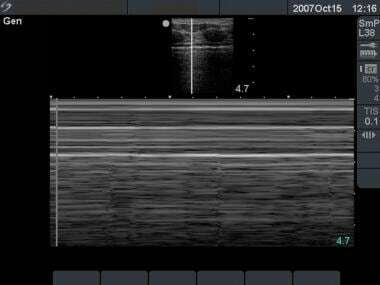 Ultrasonographic findings suggestive of a pneumothorax have been thoroughly researched and are well described in the literature. [27, 28, 29] The following is a summary of the most routinely used diagnostic signs. The presence of a pneumothorax is characterized by the following findings: (1) the absence of pleural (lung) sliding; (2) the absence of so-called comet-tail artifacts, also referred to as B-lines; (3) the absence of a lung pulse; and (4) the presence of one or more lung points. [30, 17] The so-called lung point is a somewhat recently described sign that, although difficult to identify, is pathognomonic for a pneumothorax and can be used to measure the size of the pneumothorax. In normal patients, the pleural line represents both the parietal and visceral layers of the pleura, and back-and-forth sliding of that line is easily visualized during the respiratory cycle. The lung pulse refers to the subtle movement of the visceral upon the parietal pleural along with cardiac beats. In the presence of a pneumothorax, air accumulates between the 2 layers and blocks transmission of sound waves, so that the sliding is not visualized. This phenomenon can be seen in real time in the 2-D mode but is more easily visualized by viewing a still image in M-mode (motion mode; see the video below). Normal pleural (lung) sliding, as seen in 2-D mode and M-mode. The appearance of normal lung has been described as the seashore sign (see the first image below). This term refers to the change in appearance between soft tissue and lung, divided by the pleural line, a change resembling that between sand and sea waves. In the presence of a pneumothorax, this demarcation is lost, and the appearance on M-mode imaging is described as the stratosphere sign (see the second image below). M-mode ultrasonography showing seashore sign, indicating normal lungs. No pneumothorax exists. 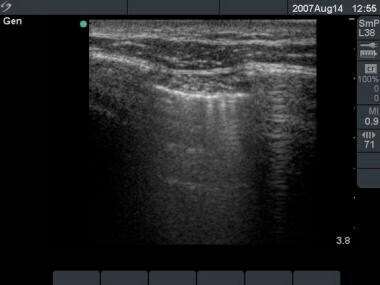 M-mode ultrasonography showing stratosphere sign, indicating pneumothorax. Comet tails are artifacts that are thought to be created when ultrasound waves bounce off the interface between the apposing visceral and parietal layers of the pleura. They appear as hypoechoic vertical raylike projections off the pleural line and are parallel to the rib shadows previously noted (see the image below). The presence of air in the pleural space inhibits the propagation of sound waves, preventing the appearance of comet tails. Comet-tail artifacts may be hard to visualize, requiring considerable patience; the transducer should be kept in a fixed location on the chest as the dynamic lung is observed sliding throughout the expiratory cycle. The presence of comet tails is 60% specific for the absence of pneumothorax. Combined with the absence of lung sliding, the absence of comet tails has a negative predictive value of 100% and a specificity of 96.5%. The lung point is a more recently described sign that is pathognomonic for the presence of a pneumothorax. The lung point is the actual point at which the normal lung pattern (ie, lung sliding and comet-tail artifacts) is replaced by a pattern consistent with a pneumothorax (ie, no lung sliding and no comet-tail artifacts). The lung point is a dynamic sign and, like the comet tails, can be visualized only by keeping the transducer in a fixed position and watching the pleura throughout the respiratory cycle. This point should be sought by longitudinally scanning the anterior, lateral, and posterior positions of the chest wall. Although it is the most specific sign of pneumothorax, it is also the hardest to visualize and may require an experienced operator to locate. Finding both transition zones (from normal lung to pneumothorax and then back again) allows calculation of pneumothorax size. Bedside ultrasonography for pneumothorax has no complications, aside from incorrect diagnosis of the presence or absence of a pneumothorax without correct identification of associated signs (or the lack thereof). If the ultrasound study is inconclusive, a definitive study with thoracic CT scanning is recommended; this remains the criterion standard for identifying pneumothoraces. ATLS: Advanced Trauma Life Support. Available at http://www.facs.org/trauma/atls/index.html. Kendall JL, Hoffenberg SR, Smith RS. History of emergency and critical care ultrasound: the evolution of a new imaging paradigm. Crit Care Med. 2007 May. 35(5 Suppl):S126-30. [Medline]. Zhang M, Liu ZH, Yang JX, Gan JX, Xu SW, You XD, et al. Rapid detection of pneumothorax by ultrasonography in patients with multiple trauma. Crit Care. 2006. 10(4):R112. [Medline]. [Full Text]. 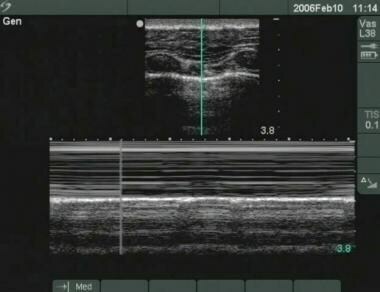 Nagarsheth K, Kurek S. Ultrasound detection of pneumothorax compared with chest x-ray and computed tomography scan. Am Surg. 2011 Apr. 77(4):480-4. [Medline]. Summers SM, Chin EJ, Long BJ, Grisell RD, Knight JG, Grathwohl KW, et al. Computerized Diagnostic Assistant for the Automatic Detection of Pneumothorax on Ultrasound: A Pilot Study. West J Emerg Med. 2016 Mar. 17 (2):209-15. [Medline]. Mowery NT, Gunter OL, Collier BR, Diaz JJ Jr, Haut E, Hildreth A, et al. Practice management guidelines for management of hemothorax and occult pneumothorax. J Trauma. 2011 Feb. 70(2):510-8. [Medline]. Wilkerson RG, Stone MB. Sensitivity of bedside ultrasound and supine anteroposterior chest radiographs for the identification of pneumothorax after blunt trauma. Acad Emerg Med. 2010 Jan. 17(1):11-7. [Medline]. Soult MC, Weireter LJ, Britt RC, Collins JN, Novosel TJ, Reed SF, et al. Can routine trauma bay chest x-ray be bypassed with an extended focused assessment with sonography for trauma examination?. Am Surg. 2015 Apr. 81 (4):336-40. [Medline]. Ianniello S, Di Giacomo V, Sessa B, Miele V. First-line sonographic diagnosis of pneumothorax in major trauma: accuracy of e-FAST and comparison with multidetector computed tomography. Radiol Med. 2014 Sep. 119(9):674-80. [Medline]. Brook OR, Beck-Razi N, Abadi S, Filatov J, Ilivitzki A, Litmanovich D, et al. Sonographic detection of pneumothorax by radiology residents as part of extended focused assessment with sonography for trauma. J Ultrasound Med. 2009 Jun. 28(6):749-55. [Medline]. Zago M. Time for a comprehensive ultrasound-enhanced trauma management. Eur J Trauma Emerg Surg. 2009. 35(4):339-340. [Full Text]. Rippey JC, Royse AG. Ultrasound in trauma. Best Pract Res Clin Anaesthesiol. 2009 Sep. 23(3):343-62. [Medline]. Matsushima K, Frankel HL. Bedside ultrasound can safely eliminate the need for chest radiographs after central venous catheter placement: CVC sono in the surgical ICU (SICU). J Surg Res. 2010 Sep. 163(1):155-61. [Medline]. Stefanidis K, Dimopoulos S, Nanas S. Basic principles and current applications of lung ultrasonography in the intensive care unit. Respirology. 2011 Feb. 16(2):249-56. [Medline]. Elia F, Ferrari G, Molino P, Aprà F. Lung ultrasound in postprocedural pneumothorax. Acad Emerg Med. 2010 Jul. 17(7):e81-2. [Medline]. Shostak E, Brylka D, Krepp J, Pua B, Sanders A. Bedside sonography for detection of postprocedure pneumothorax. J Ultrasound Med. 2013 Jun. 32(6):1003-9. [Medline]. [Full Text]. Volpicelli G, Elbarbary M, Blaivas M, Lichtenstein DA, Mathis G, Kirkpatrick AW. International evidence-based recommendations for point-of-care lung ultrasound. Intensive Care Med. 2012 Apr. 38(4):577-91. [Medline]. Quick JA, Uhlich RM, Ahmad S, Barnes SL, Coughenour JP. In-flight ultrasound identification of pneumothorax. Emerg Radiol. 2016 Feb. 23 (1):3-7. [Medline]. Focus on: ultrasound detection of traumatic anterior pneumothorax. ACEP.org. Available at http://www.acep.org/publications.aspx?LinkIdentifier=id&id=43362&fid=42760&Mo=No&taxid=112591. Wernecke K, Galanski M, Peters PE, Hansen J. Pneumothorax: evaluation by ultrasound--preliminary results. J Thorac Imaging. 1987 Apr. 2(2):76-8. [Medline]. Alsalim W, Lewis D. Towards evidence based emergency medicine: Best BETs from the Manchester Royal Infirmary. BET 1: Is ultrasound or chest x ray best for the diagnosis of pneumothorax in the emergency department?. Emerg Med J. 2009 Jun. 26(6):434-5. [Medline]. Blaivas M, Lyon M, Duggal S. A prospective comparison of supine chest radiography and bedside ultrasound for the diagnosis of traumatic pneumothorax. Acad Emerg Med. 2005 Sep. 12(9):844-9. [Medline]. Ding W, Shen Y, Yang J, He X, Zhang M. Diagnosis of pneumothorax by radiography and ultrasonography--a meta-analysis. Chest. 2011 May 5. [Medline]. Smith J. Focused assessment with sonography in trauma (FAST): should its role be reconsidered?. Postgrad Med J. 2010 May. 86(1015):285-91. [Medline]. American College of Emergency Physicians: Policy Statement: Emergency Ultrasound Guidelines. Available at http://www.acep.org/workarea/downloadasset.aspx?id=32878. Noble VE. Think ultrasound when evaluating for pneumothorax. J Ultrasound Med. 2012 Mar. 31(3):501-4. [Medline]. Stone MB. 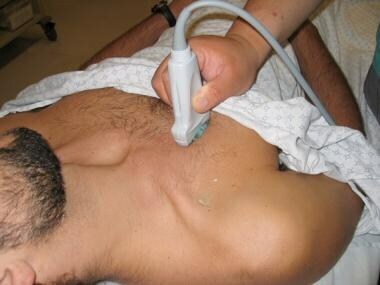 Ultrasound diagnosis of traumatic pneumothorax. J Emerg Trauma Shock. 2008 Jan. 1(1):19-20. [Medline]. [Full Text]. Barillari A, Kiuru S. Detection of spontaneous pneumothorax with chest ultrasound in the emergency department. Intern Emerg Med. 2010 Jun. 5(3):253-5. [Medline]. Weingart S. Pneumothorax. EMCrit.org. Available at http://emcrit.org/ultrasound/pneumo.htm. Article Prehospital Ultrasound: Ready for Prime Time?